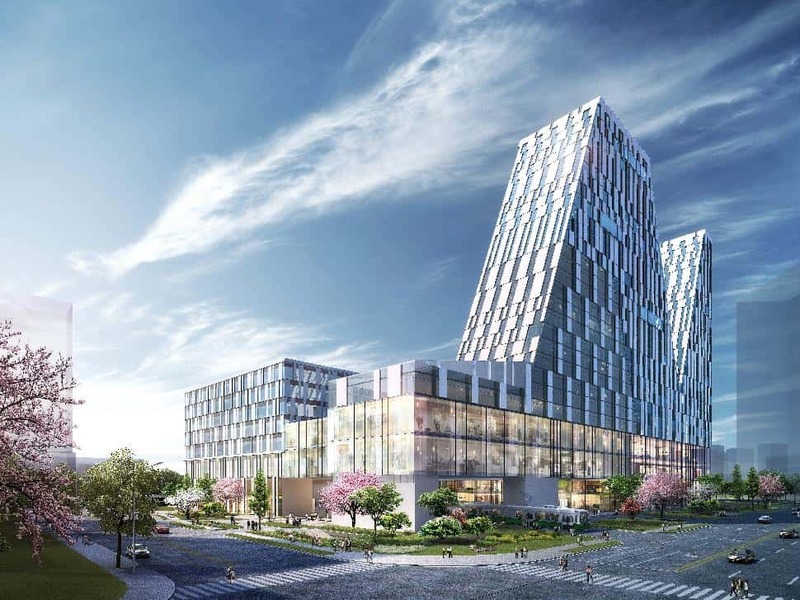 International architecture firm 5+design has announced plans for Diamond Hill, a highly cultivated mixed-use project located in Shenyang, China, whose residential, office and retail spaces will be built atop a fully integrated transportation hub. 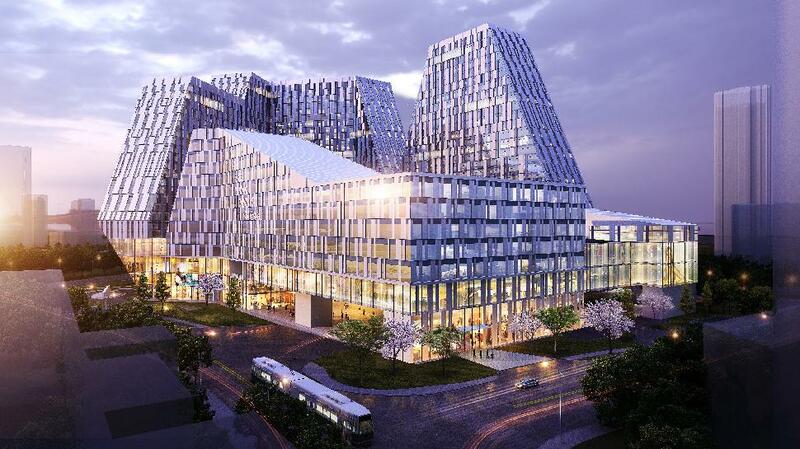 The hub will connect Shenyang’s regional mass transit network with a transportation interchange that includes both a bus depot and a LRT station on the ground level of the project. This connectivity to the greater city will ensure both convenient access to the project for visitors, and to the city for the project’s residents. The firm designed the project with a strong transportation system as a way to effectively bring people to centre while providing main transportation means for the centre's many residents. Inspired by the mountains of traditional Chinese landscape paintings, Diamond Hills’ sophisticated design evolved from the mapping of sunlight onto the site. With analysis of the sunlight’s path, 5+design was able to create a layered design that met strict local code requirements regarding sun and shadow in relation to residential buildings. 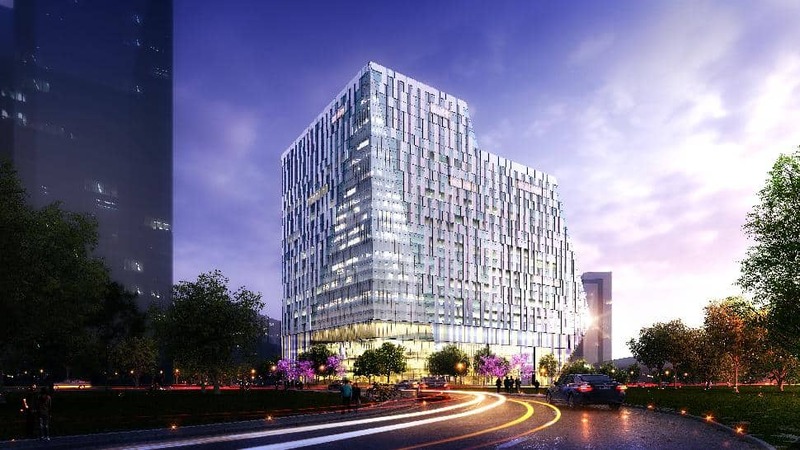 “In China, there are code ordinances that require each residential building to receive a minimum of two hours of sunshine on the shortest day of the year”, said project designer Ramon Hone. “This means that buildings nearby must be designed so as not to block the sun. 5+design also resolved building size requirements that called for 77,000 square metres of residential with 23,000 square metres designated for SOHO lofts, 42,000 square metres of office, and 74,000 square meters of retail. By hollowing out the centre of the project and leaving a donut-like perimeter of residences, appropriate widths for all three building types were met while concurrently maintaining the sun code requirements. Diamond Hill’s mountainous profile was created by trimming away areas of the project the project that blocked sun access to residences, giving the project a radically different look and feel from all sides. 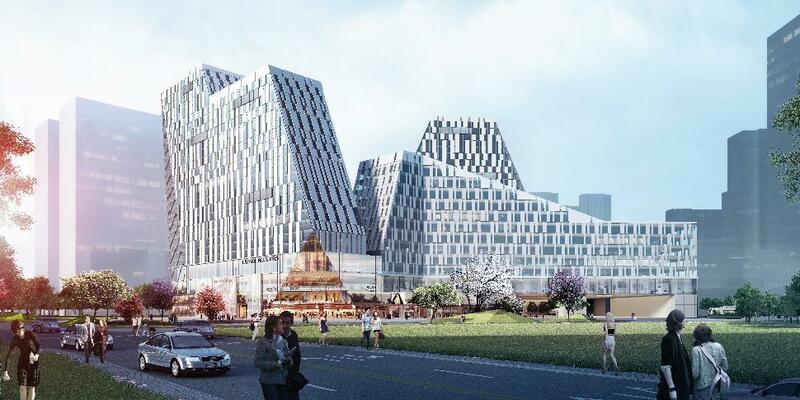 The four-story mall, topped by a roof garden and large skylights to protect against the Laoning province’s severe winters, will be encircled by office and residential buildings whose dramatic profiles echo snow-capped peaks and fertile valleys. 5+design’s palette of materials will further enhance the landscape metaphor, with exteriors featuring alternating panels of glass and porcelain to evoke textured layers of sedimentary rock. In the middle of the project, the atrium symbolizes a pristine lake, with skylights of translucent and fritted glass – like a series of mountain lakes – allow light to filter down through all floors.